A Colorado-based asthma expert set the record straight on several of the misconceptions perpetuated by the Johns Hopkins University fracking study in a recent interview with KREX-TV in Grand Junction, Col.
Dr. David Scott of the Allergy and Asthma Center of Western Colorado told KREX the study offers no evidence that the actual fracking process plays any role in either causing asthma or exacerbating asthma. Scott also emphasized the “association” is a shaky one, considering several factors completely unrelated to fracking — both in the Johns Hopkins Pennsylvania study area, and the Grand Rapids area, where fracking is prevalent — could be causing increased asthma exacerbations. When researchers at Johns Hopkins University released a study on Monday suggesting that fracking causes asthma attacks, Energy In Depth noted that it was more than a little strange that the researchers didn’t include county-by-county comparisons between areas in Pennsylvania with and without shale development – which presumably would have been a slam dunk if their conclusions were sound, right? Well, it turns out the researchers’ failure to do so might have something to do with the fact that Pennsylvania Department of Health data show that heavily-drilled counties within the study area have far lower age-adjusted rates of asthma hospitalizations than nine counties in the study area that have no shale gas production at all. The following map from the Pennsylvania Department of Health’s 2015 Asthma Focus Report shows age adjusted inpatient hospitalization rates per 10,000 people due to asthma in Pennsylvania from 2009-2013. 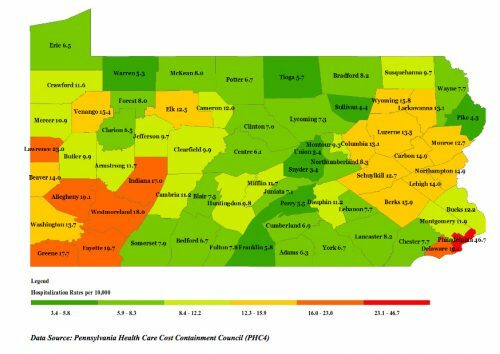 EID added these impatient hospitalization rates from the data above to the top five shale counties in the study area, as well as nine notable counties with no production at all, to the map highlighting shale wells in Pennsylvania that was included in the study. As the map shows (with EID’s inclusions), asthma hospitalization rates in the top five shale counties in the study — Bradford (8.2), Tioga (5.7), Lycoming (7.3), Sullivan (4.4) and Susquehanna (9.7) — are far lower than nine counties in the study area with no shale production, all of which are above 11.2 per 10,000. The icing on the cake is that the 2009 to 2013 the Pennsylvania Department of Health data actually show a significant 26 percent reduction in inpatient asthma hospitalizations throughout the entire state. 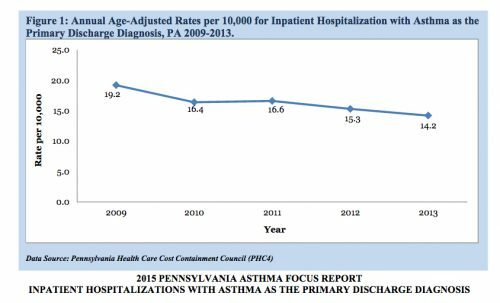 As the above graphic from the report shows, asthma hospitalization rates in Pennsylvania declined from 19.2 per 10,000 a year to 14.2 per 10,000 between 2009 and 2013 — which just so happens to be the time the shale boom really took off. Considering Pennsylvania was one of the most prolific shale states over those years, wouldn’t asthma hospitalizations have skyrocketed during those years if the researchers conclusions were correct? 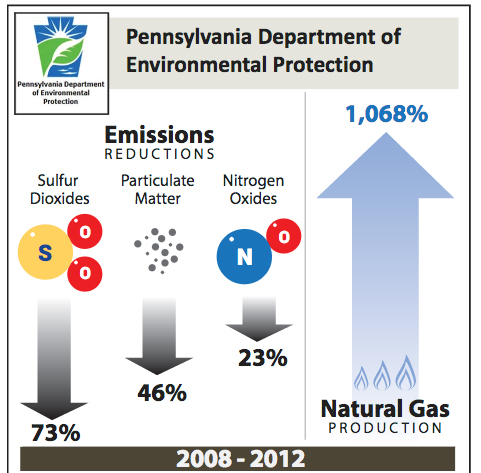 Not coincidentally sulfur dioxide, nitrogen oxide and fine particulate matter all started decreasing rapidly in Pennsylvania during that time, as the following EID graphic illustrates. According Pennsylvania Department of Environmental Protection (PEDEP) and EIA data, these reductions represent between $14 billion and $37 billion of annual public health benefit, based on U.S. Environmental Protection Agency (EPA) methodologies. 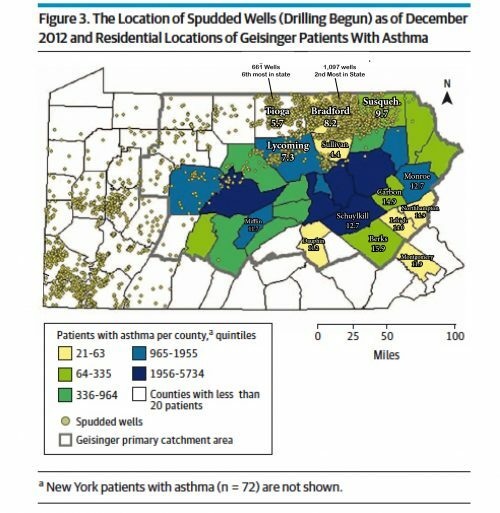 The researchers’ conclusion that proximity to shale gas wells leads to asthma attacks is destroyed by state health department data. It certainly demonstrates that headlines such as “Study: Asthma increases living near fracking sites” and “Study: Asthma attacks linked to fracking in Pa.” are wildly inaccurate. News outlets even produced these headlines despite the fact that the researchers themselves admitted that they didn’t have the data to make that direct link. But as EID pointed out before, this is the same team of researchers who published a study claiming premature birthrates were higher in counties closest to shale wells, even though they were right in line with the national premature birth rate, so that should have sent up some red flags. The fact that one of the authors, Brian Schwartz, is a fellow at the Post Carbon Institute, which has called fracking a “virus” should have given reporters pause as well. The fact that the researchers ignored the data from the Pennsylvania Asthma Focus Report that clearly demonstrated their studies’ conclusions were highly questionable isn’t all the surprising, given the researchers’ well-documented biases. What is disappointing is the fact that the researchers’ conclusions were widely reported as the truth when just a little scrutiny would have revealed the study deserved none of the legitimacy all the media coverage afforded it.